Congress don’t want it, two thirds of voters in a poll are against it, the Republicans wish it would go away, illegal immigration has diminished over recent years and illegal drugs don’t come across the border but through ports. In the face of resistance and reality Trump sails full steam ahead, declaring a national emergency to railroad through his wall. It’ll run into myriad legal challenges and almost certainly won’t happen but then he’ll be able to blame the rest of the universe for him breaking his campaign promise. Sean Hannity, the Talk Show host on Fox News, has been egging him on of late which given the endless non-working hours he sits glued to the channel, coke in one hand and burger in the other, has clearly had an impact. 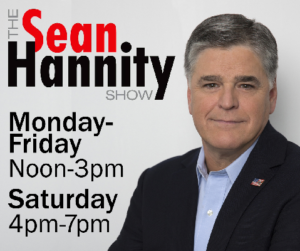 Hannity, 30 December 1961 10.30 am New York is an aggressively ambitious Sun Mars in Capricorn in a determined and volatile trine to Pluto and Uranus in Virgo. His status-quo-upsetting Uranus sits exactly on Trump’s Ascendant so he will play on Trump’s defiant streak. Hannity’s pie-in-the-sky Jupiter square Neptune is also in hard aspect to Trump’s Pluto so he’ll fill his head full of fantasy hopes. 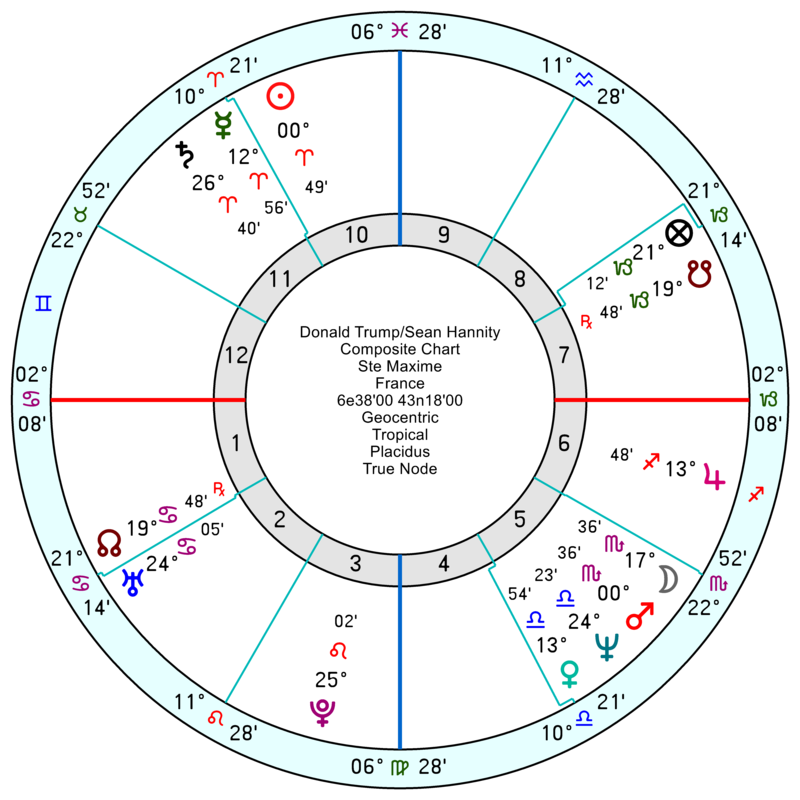 Hannity’s Libra Moon is conjunct Trump’s Jupiter which makes for an amiable connection. Their relationship chart is fairly fraught and runs on a fair amount of anger which as long as it is channelled outwards will keep their joint ship afloat. Though the risk is if it turns inwards, it’ll get destructive. Their composite Saturn opposes Neptune and Mars and squares Uranus – and that will be rattled sharply from March 6th as tr Uranus opposes the composite Mars for a few weeks; with heavier pressures and concerns in 2020/2021. Though Hannity’s personal chart looks on a lucky and successful roll for the next two or three years despite the odd blip. The other rabble rouser about immigration in the White House is Stephen Miller, born 23 August 1985 4.53 pm Santa Monica, CA. 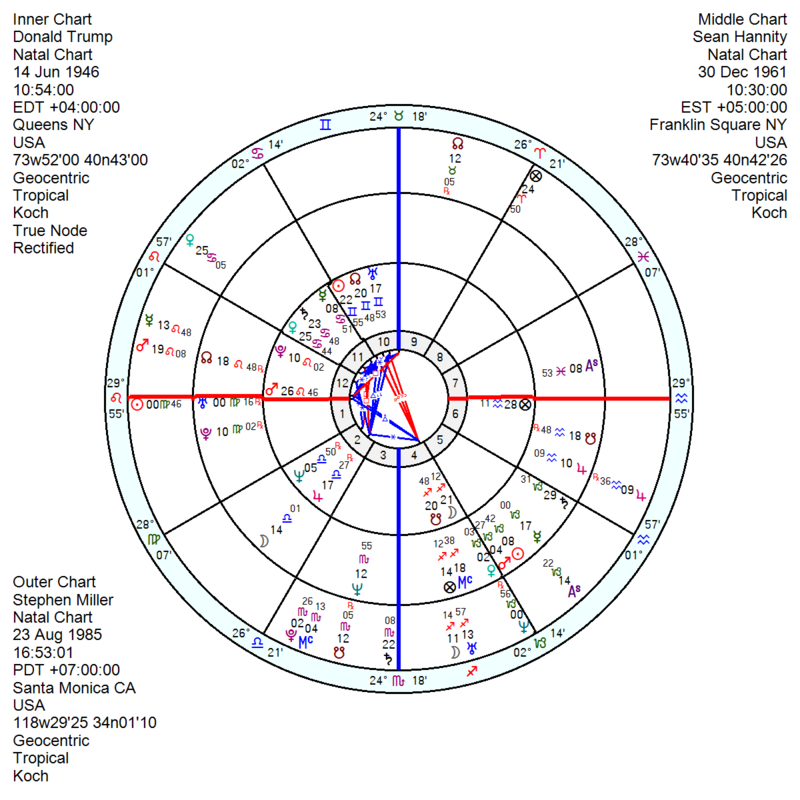 His Virgo Sun is conjunct Trump’s Ascendant (and Hannity’s Uranus), so he’s a key POTUS adviser. Like Trump he has Venus in Cancer (at the same degree), Mars in Leo and a Sagittarius Moon – Trump must think he’s found a mini-me. 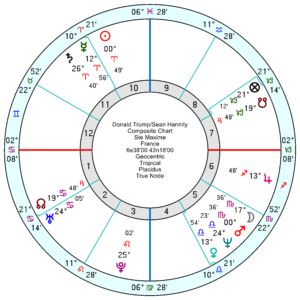 Miller’s Jupiter in Aquarius opposes Trump’s Pluto with his Pluto in square, so his pushy confidence will prompt Trump into behind-the-scenes power plays. But Miller is heading into a few sudden disruptive turnarounds this year from April onwards with tr Uranus opposing his Pluto and midheaven; and in general is into a less successful, lower profile few years as tr Saturn disappears below his Ascendant. From January 6th post on Donald Trump’s timeline. From 13 February to 30 March he picks up tr Pluto opposition his Mars/Uranus midpoint, which is a test of nerves, overly excitable, violent emotions, high insecurity, can be accident or operation. And following directly after that are three seriously challenging, bad tempered, trapped and discouraging Pluto transits in hard aspect to Mars/Node, Moon/Mars and his natal Saturn from March 31st to May 20. These will repeat on and off till late 2020. His Progressed Moon moving through his 12th will conjunct his Mars at the start of April as well which is likely to provoke an explosion of rage. His Solar Return from birthday June 2019 to June 2020 is formidably difficult with Saturn Pluto in the 10th opposition a 4th house Mars Mercury, which looks like a career dead-halt. That’s his timeline for the next few months which does look like a gathering storm. Trump’s big mistake legally was saying “I didn’t need to do this” in his rambling Rose Garden speech. Nancy Pelosi has already picked up on this in a tweet so doesn’t sound like he’ll be getting his wall anytime soon. More fundamental, Trump clearly does not comprehend the notion of oversight. He still operates the presidency like one of his many failed businesses. In that matter, which of them actually turned a penny of legit profit? Thanks for the Trump Playlist for the next couple of quarters. My god, someone actually voted for this comedian. It sits well that eventually he’ll be toppled off his perch. Good reading and “entertainment”. I’ll be sure to buy some Jiffy-Pop and Coke but leave off the “hamberders”.